Eslam Rishekan Mishavad, Iran baz Iran Mishavad!!! Thanks to Kamangir for having uploaded this clip. Please read these very informative articles regarding the mullah's disinformation and manipulation campaign in the USA through various lobbyists and front organizations such as NIAC/AIC and lobbyists strategically placed in various Think Tanks. This particular article focuses on but one of these individuals - Dr Ray Takhey, a senior fellow at the Washington Think Tank "Council for Foreign Relations". The author has previously released a comprehensive report on the Islamic Republic's lobby organization in the USA which goes under the name "National Iranian American Council" (NIAC) and its President Trita Parsi. In recent days the occupational Islamist regime have carried out several barbaric public executions to instill fear amongst the populace. As per usual it buses in a crowd to watch the spectacle, which is also joined by Iranians who attend on their own free will - for what reasons these latter join I really cannot tell; the only reason in defense of them which I can think of is that they are either related to the victims in some way or are there to document the crime for human rights organisations and the general public inside and outside the country. What is even more disturbing is the attendance of children at these barbaric public shows of the Islamic regime which goes to show what kind of truly careless and shameless parents these children have - in a sane society the people who attend on their own free will, in particular those who drag their children to such horrific scenes, would be taken care of at either mental institutions or rehab centers in hope of curing their psychological illness. The most recent public execution by the Islamist regime involved the killers of a filthy Islamic cleric who presides as a "Morality Judge", who without any doubt tortured, imprisoned, fined, and even killed many innocent Iranians on charges such as immodest dress, for extramarital relations and other absurd charges which are contrary to the inhumane Islamic doctrine. One of the individuals who participated in the killing of this Islamic judge held his head high as he faced his executioners with a smile on his face - this brave defiance must have really upset the Mullah's who are desperate to instill fear in the hearts and minds of the Iranian people with their barbaric Islamic rule. To read more on the recent reign of terror of the Islamists occupying Iran please read THIS ARTICLE. On the occasion of Shahanshah Aryamehr's passing his sister, Her Imperial Highness Princess Ashraf of Iran, pays an annual tribute to her brother by publishing a piece in the Herald Tribune newspaper; please find the original english article below, accompanied by a persian translation. 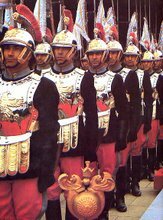 People not knowledgeable in Iranian affaires who have heard or read something here and there always bring up the argument of there not being an ideal democracy in place during the Shah and that it was for this reason that "the people" rose up against the Shah. 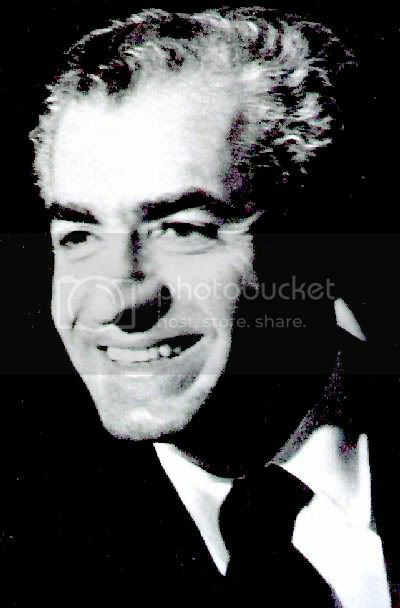 Little do they know that the Shah's ultimate goal, and which was attested by the incremental freedoms being introduced into Iranian society, was to establish a sufficient democratic state where the people would be able to make informed decisions in regards to parliamentary elections and other areas concerning their future - however there was one step which had to be fulfilled before such democracy could be introduced and that was for the country's illiteracy and intellectual level to be raised to a satisfactory level; this was a point which the Shahanshah always stood by. 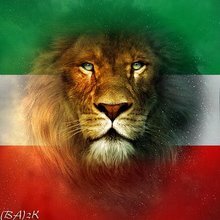 If this intellectual level was not reached the Shahanshah of Iran knew that his people would be used as tools by foreign powers be they Communists, the backward and anti-Iranian Muslim clergy, and political factions in the USA and Europe. Winston Churchill hit the nail with his famous quote of "the best argument against democracy is a five-minute conversation with the average voter" - note that this quote refers to the average voter who presumably has achieved some form of recognized intellectual level! Not having yet reached that satisfactory point and seeing the impressive growth, progress, and influence which Iran under the leadership of Shahanshah Aryamehr was achieving, foreign powers, to protect their interests (oil and influence), decided to focus their efforts to bring the Shah down and revert the path of progress which the Pahlavi Dynasty had put the nation on; this would be achieved through an intense propaganda campaign and financial/logistical support to reactionary factions seeking to topple the Iranian government. I do really hope that my compatriots, especially of the young generation which myself and the majority of the Iranian nation belongs to, finally see through the cloud of lies and that we can build a more solid future for our nation so that we never again have to endure another dark age of the kind we have witnessed for the past 28 years. It was during the first days of Mehdi Bazargan's provisional government in February 1979. The country was still reeling from revolutionary intoxication. I was traveling in a bus going from Bandar Abbas to Kerman. Not before long a few passengers started chanting slogans and prompting other people with their hoarse voices to shouts of "begoo" this or "begoo" that. Many other people joined them and soon the whole bus was in uproar, cursing the ancien regime and blessing the unknown emerging new establishment. I was looking out of the window surveying the vast bareness enveloping the asphalt road when all of a sudden I became sensible of a hush in the bus. The dignified, calm voice of a passenger sitting a few rows away from me made everyone sit up and take notice. All the clamor had died down. His indignant words could be heard admonishing the crowd: "Why are you insulting our country?" individual. He did not let himself be carried away and manipulated as someone else's pawn and mouthpiece. He dared to speak up risking attack, insults or even worse. Whenever we have been able to rescue ourselves from mob mentality, thinking with fairness, courage and wisdom, in our heart of hearts we have honored and saluted the memory of the Shah Mohammad Reza Pahlavi. The Shah spoke not to our mob mentality but addressed our intelligent self. He articulated himself slowly and deliberately, measuring every word. He was no rabble-rouser. He kept his focus on his country's long term interests rather than his own approval rates and popularity. Although he was a man of faith, the Shah revered religion too much to use it in Hafez's words as a "snare of hypocrisy" and an instrument of power and control. Believing in the freedom of worship, he allowed people to choose their own way of reaching God and communicating with him. Those people who envied him and resented their own inability to emulate his dignity and grace accused him of being a haughty man. It is true that he was a proud person. His pride however did not come from his self-centeredness or narcissism. It came from his deep belief in the greatness of the country in which he was the monarch. It was based on his total devotion to and admiration for his homeland. open and impartial court of justice. The course of events have more than justified and proved him right. He has given his answer to that fair and fearless judge called history; a judge that cannot be flogged to submission or talked down or prompted to "begoo" this or "nagoo that.